Right now major cruise lines are keeping their ships away from Tropical Storm Florence which is set to become a major Hurricane in the Atlantic and Hurricane Olivia in the Pacific. We’re at the height of the season and let’s see which cruise ships are currently being impacted. Hurricane season is now very active, and as of writing this there are three storms in the Atlantic along with a new fourth possible storm and in the Pacific Hurricane Olivia is heading towards Hawaii. All the major cruise lines are monitoring all storm developments including Tropical Storm Florence which is moving west and expected to hit the U.S. East Coast next week. 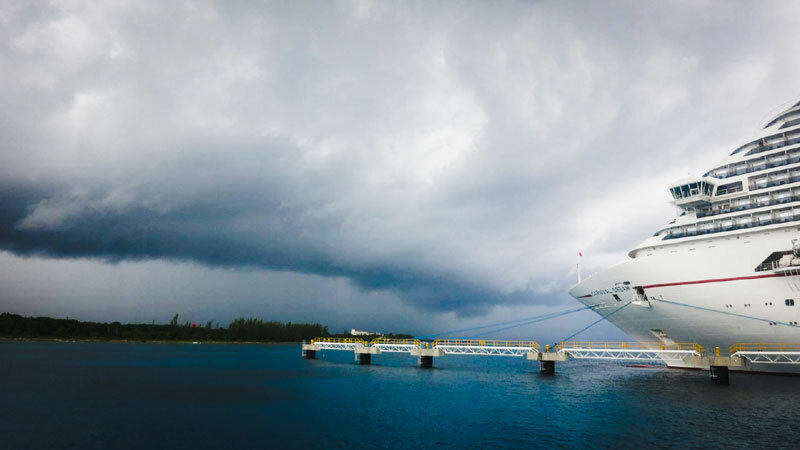 Carnival Cruise Line, Royal Caribbean, and Norwegian Cruise Line are all keeping their ships away by changing itineraries, canceling ports and adjusting sailing times. So far Carnival has two ships impacted by Florence including the newest ship in the fleet. Carnival Horizon and Carnival Pride have altered their itineraries. The current September 5 sailing from Carnival Horizon has been altered with an extended stay in Grand Turk on September 8. The cruise line will continue to monitor Tropical Storm Florence, and it could cause the scheduled visit to San Juan, Puerto Rico to be canceled. It doesn’t mean that passengers have a longer stay in Amber Cove instead on the same day. Carnival Pride is also impacted by Florence with its 7-night September 9 sailing from Baltimore now changed. The Spirit class vessel will cancel the scheduled call in Bermuda by sailing far away with calls in Grand Turk, Half Moon Cay, and Freeport. Check our dedicated post with further details about the two Carnival ship changes right here. Norwegian Cruise Line is keeping guests updated on the impact of Tropical Storm Florence in the Atlantic and Hurricane Olivia in the Pacific. Ships which already have itinerary adjustments includes Norwegian Escape and Norwegian Dawn. The cruise line is also monitoring Pride of America based in Hawaii and there could be upcoming changes for that ship. Norwegian Escape will no longer be sailing to Bermuda for its September departure from New York City. The first breakaway plus class cruise ship will instead sail to Port Canaveral, Nassau and Great Stirrup Cay in the Bahamas. Norwegian Dawn’s Bermuda sailing which departed Boston yesterday, September 7 will no longer include a call in Bermuda. The ship will keep guests and crew safe by sailing to Halifax and Sydney, St. John, New Brunswick and Bar Harbor in Maine. Pride of America which is based out of Honolulu, Hawaii could have an altered September 8 sailing. NCL will keep an eye on Hurricane Olivia which is currently a category 1 and moving towards the islands in the Pacific. More details about the ship changes for Norwegian Cruise Line can be found here. Royal Caribbean which is another major cruise line is also being impacted by the wild storms which are not coming up in the Atlantic. So far only Grandeur of the Seas has an altered itinerary, but this could change as Tropical Storm Florence develops. The Grandeur of the Seas September 8 sailing from Baltimore has been altered. The ship has canceled the scheduled port of call to Kings Wharf, Bermuda. Instead, the Royal Caribbean cruise ship will sail to Nassau, Bahamas to stay away from the storm as it heads towards the U.S. east coast. The ship will also stay in port overnight. Check our post about this ship itinerary change here. Right now there is huge activity, and we must advise you to check with the cruise line for official updates if you have any cruises coming up in the next week. There is a huge focus on Tropical Storm Florence at the moment as it is likely to hit the East Coast and reach a major Hurricane status. This means more cruise ship itinerary changes are pretty much going to happen, possible cruise port closures along the U.S. east coast with high swells, strong winds, and heavy rainfall. According to the National Hurricane Center (NOAA), Florence has maximum sustained winds of 70 mph and is expected to start impacting the U.S. coastline over the weekend. Hurricane Olivia has maximum sustained winds of 85 mph and has weakened to a category 1. Olivia will reach the Hawaiian island on Tuesday. We’re also watching Tropical Storm Isaac which is heading towards the eastern Caribbean and will become a Hurricane on Tuesday morning. Keep checking Cruise Hive for all the latest developments impacting the cruise industry.